Team Evotri: Mark Allen: Part Deux! Eagerly Awaited Part II of the Mark Allen interview... Check out part I here, if you missed it! JP: On the flip side of your best race ever, walk us through your worst day in Kona. MA: My worst day was in 1984. I had about a 12-minute lead off the bike and thought there was no way anyone could catch me. I was waving to the crowd as I ran through the town of Kona before heading out onto the Queen K highway and the desolate lava that can sap your energy and confidence in a matter of moments if you are overconfident. And indeed that described how I was racing those opening miles. At the bottom of the hill that leads out onto the Queen K, I felt like a champ. At the top of that hill I felt like all my energy had leaked out of my body. I knew it would just be a matter of time before I was caught. Dave Scott passed a while later as I was eventually reduced to walking. I looked so bad that the medical team came to me and wanted me to drop out. JP: Did you do anything unique to prepare for the Ironman World Championships? MA: We trained all year to get in good enough shape that we could do a short Ironman block of training that was very intense and lasted about 6 weeks. Those six weeks were what took about 9 months of building fitness and fine-tuned it for Kona. That was the physical level, and it included some very long and intense sessions. I won’t go into them because I don’t want people to think that if they did them they would win their age group or set a PR. The amount that we did only worked because of the 9 months of base we put down and also because this was our job and we had all day to do the workouts and recover. But I also did something that no other person did. I would take part in Brant’s summer retreats right at the point where my training partners were ready to up the ante in the workouts. I would go away for a week or more and do zero swimming, cycling or running and just focus on building that internal strength and calm that would hopefully carry me to victory in a few months time. This is what helped me to be able to deal with that internal chatter than can derail your best efforts, and what gave me the confidence to indeed give everything I had even if victory seemed impossible in the moment. JP: It seems that people handle the transition out of professional athletics differently. What was it like for you when you had to hang up the racing flats, goggle, and helmet? MA: The decision and timing for me was absolutely clear. There was not a shred of doubt that I was making the right decision at the right time. So for me it was about as easy as I think it can be. I would not say this is the norm, however. I had planned for this my whole career, though, and knew that whatever came next I would not be as good at it at least initially as I was at the sport of triathlons at the point that I retired from racing. I spoke with a lot of athletes at Nike who had made this transition, and they all commented that the biggest mistake in an athlete’s mindset when they finish their competitive careers is thinking that they will be at the top of whatever they do next right from the start. Many end of at the top eventually in a second or third career, but it is a learning curve that takes time and a bit of humility. Our next workshop is in Los Angeles, CA on April 24th, 2010. JP: You have been a busy man since your departure from the pro ranks. What led you to start up your coaching business? MA: I felt like I sifted through the myriad of possible ways to train the body to get race ready and found what really worked and what didn’t, and I wanted to share that info and expertise with athletes in the sport. I partnered up with Luis Vargas who is a software expert and a many time Ironman finisher in Kona. Together we put together our online coaching. It’s now used by athletes in over 50 countries and we have had great success with people of all levels. Our homepage has lots of our recent successes listed. JP: You are also famously involved in the psychological aspect of sport and have recently written a book dealing with the synergy between the body and mind. What can we expect from this book? MA: Again the book is titled Fit Soul, Fit Body: 9 Keys to a Healthier, Happier You. In it Brant and I give tools for building overall fitness and health. There are as the title suggests 9 keys that we emphasize. A few that might resonate with athletes are Quiet the Mind, Know and Set Your Quest, Live What You Ask For, Connect With Nature and Manage Stress. Quieting the mind is something that just about everyone who has raced can relate to. In the tough moments, our thoughts always wander away from those that would strengthen us and find their way to the thoughts that try to get us to give up. I know this personally and had to find a way to deal with it. Some people say just replace those negatives with positives. Well, that may work in your living room, but on the race course forget it! THE best way to deal with it is to learn to quiet your mind, to silence that internal chatter. When you do that, you are then free to just go out and to what you are trained to do, which is to have a great race. Know and set your quest is a very big one also. If a person just sits for a few minutes and asked themselves what it is about going for a big race that has importance for them in their life, deep in their heart, then when it gets tough in a race, you can reflect back on that thought of why you are out there and then have meaning for the pain or challenge you find yourself it. It really does bring back confidence and a sense of purpose to those tough moments. But this must be followed with that next key, Live What You Ask For. There were many who wanted to be an Ironman Champion, but few who were willing to do the real work to get there. Then as triathletes we all use that tool of Connecting with Nature. We all feel good when we are outside training and especially with the environment is a trail or a peaceful road. We just feel good when we are in these types of places. In Kona this was so key for me to really feel in the race. Let’s face it, the black barren lava fields can look like a hell, but they can also be seen as a wonderful paradise like nowhere else on the planet. When I saw them that way, then I was so thankful that I got to race surrounded by all that beauty, and it would turn my whole mindset around when I might not be feeling so positive. Then the final key that I mentioned was Managing Stress. Stress is the number one issue that holds an athlete back from being their best. It doesn’t matter if you are talking about a first timer or a seasoned veteran in the sport. Stress kills athletic performance and inhibits fitness gains. So managing it is critical to peak performance. Favorite Dessert: Plain yogurt with some maple syrup and a few berries. Favorite Holiday: Thanksgiving. I love the food and the community atmosphere of it. Favorite Vacation Spot: My hometown of Santa Cruz. I travel all year so that I can take a holiday at my local surf breaks. 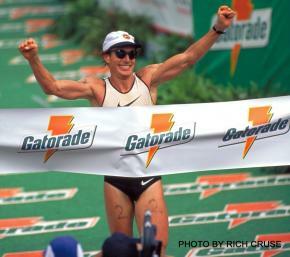 Favorite Race: Ironman in Hawaii. It tests you on more levels than any other race. It’s complex, but that is what makes it great. Favorite Workout: When I raced it was the long riding in the mountains in Colorado. We would do a two-day point to point. Day one was Boulder to Vail. The next day was Vail to Aspen. We covered some high passes and incredible scenery. Workout in the AM or PM: AM for sure. JP: A question I have been itching to ask, do you have any plans of competing in triathlon again? MA: No, it would ruin a great retirement I have going! JP: What advice would you give to the age grouper who is looking to tackle the Ironman for the first time? MA: Give yourself time to build up. This can mean taking 2-3 years to build into it. Start with shorter races as your goals to gain fitness and experience. Then each year build into longer and longer races until you are finally ready to go for an Ironman. It is best when you do it this way so that you can actually race the distance rather than just survive it. JP: What advice would you give to the age grouper who is looking to qualify for Kona? MA: Find a race that has the course design that you like to do best. You will always race best on that kind of course and also have the best experience on it. I loved hills and that is one reason why I did so well in Nice. I found flats and rolling terrain extremely challenging and that is partially why it took me so long to win in Kona. JP: Mark, thanks again. Any parting words of wisdom? MA: Really enjoy the sport, the training and your training partners. See you at the races!